This was my first trek ever so I was very nervous that it would be too hard for me. The team was very supportive and encouraging. 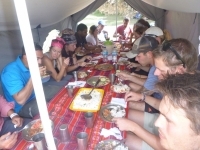 Everyone was able to go at a comfortable pace and met at many stops with Inca sites or food stops. The food was amazing and there was plenty of it. What a trip ! 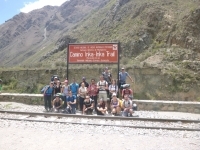 We had a fantastic 4 days with a great group of 15, awesome porters and three guides with a lot of personality. The team really made us feel like a family and we had some great laughs together and memories that I will never forget. 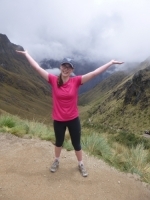 I had a fantastic time on the Inca Trail ! It was everything I imagined it would be and more. The tour guides really made the trip, they were so caring, encouraging and created such a fun environment, we really felt like one big family. I would definitely recommend this trip to all of my family and friends. Hey guys, Great experience with all the team (besides today's sickness). I loved the walks, the camping spots, the people of the crew, the games at night and the members of our crew. The food was very good and the quantities were sufficient (which is a strong statement knowing my legendary appetite). 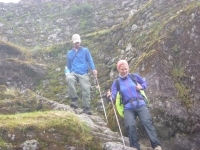 The Inca Trail trek is an amazing, unforgettable, exhausting adventure. 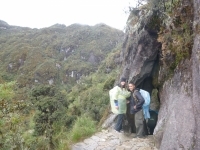 The long everyday hikes immersed me in the beautiful scenery of the mountains and jungle. 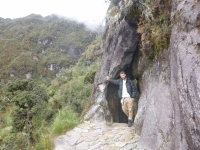 It also pushed me physically, climbing steep steps and trekking many kilometers. I witnessed and explored many of the ancient Inca ruins on the way to Machu Picchu. Never ever had I imagine what I have done in four unforgettable days. After the first day, I thought "ok, this will be fine". The second day shows me what my body can do when it's necessary ! It was one of the hardest day of my life, but every minute was worth to do. 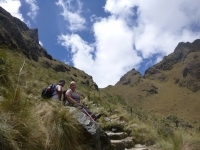 If you're looking for challenging, fun and unforgettable experience the Inca Trail is a must. Everyday is filled with new exciting experiences and challenges. Every campsite has amazing views and the guide and staff are all amazing. I have definitely been blown away and will never forget the sites, views and experiences. 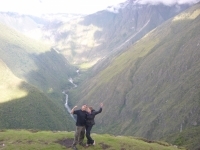 Four days of hiking the famous Inca Trail leave you exhausted, but happy. It's not an easy walk if you're not that experienced in hiking, especially the second day with five hours of constant climbing is tough, but it definitely is a life time experience. The trail was worth every penny, the guides were extremely helpful and knowledgeable and the views were virtually second to none. 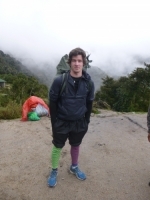 I am glad I went through Inca Trail Reservations and would recommend to anyone and may do it again in the future. 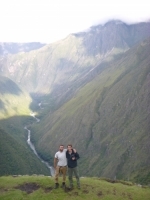 The 4 day Inca Trail trek is difficult to put into words but simply put, it was Amazing ! It will test you physically and mentally but every single moment is worth it :) The tour guides are one of a kind and know how to make this a special trip. 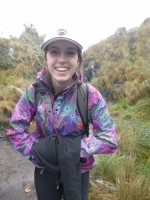 My girlfriend and I were a little skeptical about having booked the Inca Trail trek during rainy season. We were a little nervous about what was in store for us but the trek was everything anyone could ever ask for and then some.